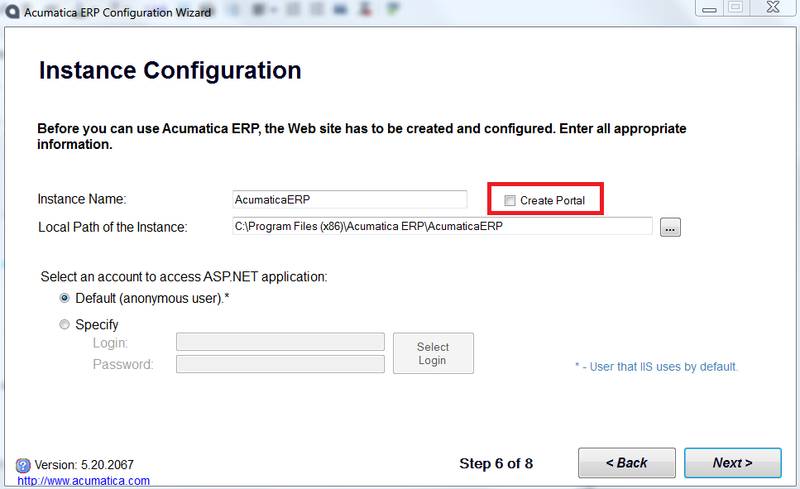 Acumatica Portal – that is additional application that comes together with ERP. Portal uses the same platform, technology and database, so you will not see any difference in user interface. But it provides separate functionality that good to use together with ERP. Portal has separate functionality that can be used by external users (Customers, Vendors, Prospects, Investors) to get access to company internal information, documentation, support and financial information (invoices / payments). Portal share the same database with ERP, so all data that is entered to portal will be automatically synchronized with ERP. The same works vice versa. The Portal installation process is very similar to the ERP process, difference is just in one check-box – “Create Portal”. The problem is that in current version of Acumatica this process is not obvious – it is very easy to make a mistake and create portal instead of ERP. Some times I have this issue with some new partners – they checking this button and in the result they see portal page instead of ERP. The reasonable question is – How to enable ERP Modules? Unfortunately to fix it, you have to reinstall Acumatica without this check-box. If you leave it empty, than after installation process you will see Acumatica ERP. That’s it! Have a nice installation!